Rescue Update #1 /Hawks Aloft Inc.
Back in June, Hawks Aloft had one crazy week where we performed five bird rescues. A previous blog post told about an American White Pelican with an injured wing and an orphaned Great Horned Owl whose nest was destroyed. A couple of our wonderful raptor rescuers, Chellye and Jeff Porter, headed down to Carlsbad after work that same day to transfer these birds up to Albuquerque. Chellye and Hawks Aloft Raptor Rescue Coordinator, Lisa Morgan met early the next morning and the birds were transferred to Lisa. 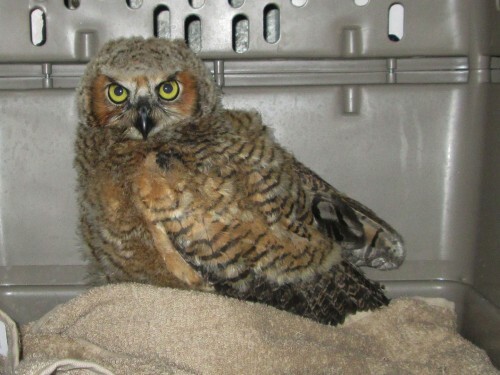 Here is an update on the orphaned Great Horned Owl. Lisa gave the owlet a thorough exam and found him in good health. He ate and rested until Lori Paras, Director of the Santa Fe Raptor Center, and volunteer Victoria Ambriz came to transport the owlet to their facility in Santa Fe. He was placed with a Great Horned Owl foster mom. 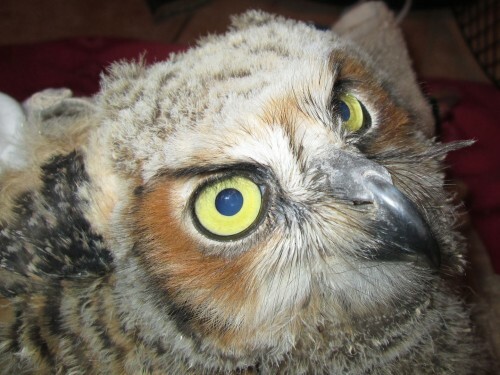 She has a permanent injury and is not flighted, but she does a wonderful job of fostering baby Great Horned Owls. She already had six foster owlets, and this little fellow was a bit smaller than they were. So he curled up next to mama near the bottom of the cage for the first few weeks. Now, he is in the higher part of the mews with the other juvenile owls. The next step for all seven juvenile owls is kill training or what we euphemistically call “mouse school.” Live prey, such as small rats, are released into the cage so the owls learn to hunt. The birds are monitored carefully to make sure that none loses weight. If they are successful, then larger prey is introduced, a process that could take two to three weeks. If they are not successful, then they are deprived of food for a very short time to see if this induces them to hunt. If not, they are fed dead prey, and the whole process starts over in a week or two. Eventually all juveniles learn to hunt. When our Great Horned Owl passes mouse school, his release will be scheduled. The Santa Fe Raptor Center, maybe with input from Hawks Aloft and New Mexico Fish and Game Service, will choose the location, or locations for all juveniles to be released. Once our juvenile is released, we will wish him a long successful life. An update on the American White Pelican that was also rescued will be the subject of a future blog.